Love Me Tender, Love Me True is located near Central Square and just 32 steps to the East Ruskin Beach Pavilion in Seaside, Florida- one of the town’s most photogenic beach walk-overs. Complete with upper-level vaulted ceilings and views of the Gulf, both floors are highlighted by tongue and groove walls and an expansive kitchen, dining, and living area. 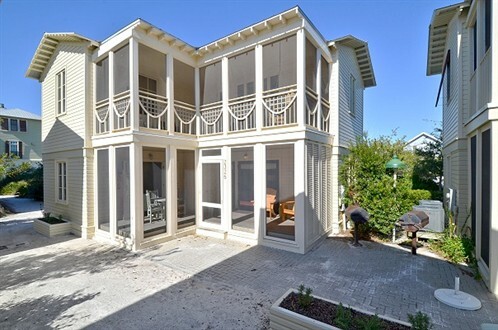 Each level features an inviting screened-in porch; upstairs, a nostalgic porch swing and views of the emerald waters of the Gulf are enjoyed, while downstairs, a screened-in porch features an outdoor shower. Each master suite is sumptuous, and the showers are oversized. For additional options, this cottage may also be rented as separate one-bedroom cottages. For more pictures of Love Me Tender, Love Me True, click here.